Established in 1998, Pinnacle has perhaps the best reputation of any traditional sports betting site in the world. They are known for great odds and high betting limits. They have been ahead of the curve on so many things in the online betting marketplace, so it should be no surprise that they offer one of the best esports betting experiences in the world. Most of Pinnacle’s esports betting markets hover around the 5% odds margin area. Oftentimes, they will be below 5%. Most competitive esports betting sites tend to be in the 8% to 10% margin range. Uncompetitive sites can hover around 15%. Getting odds margins of less than 5% will make a difference over time in terms of your winning payouts. You simply get more when you win. 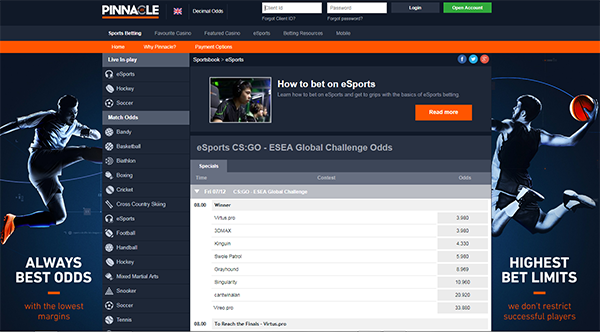 Pinnacle offers a consistently varied mix of esports betting markets. Of course they offer simple match betting or money line markets. You will also find Match Over/Unders as well as Map winner markets, Totals (Over/Under) and Handicap markets for individual Maps. Even top esports betting sites can only offer match winner betting markets. Pinnacle offers these extra markets more often than most other top esports betting sites. The only drawback here is a lack of outright winner betting markets. Pinnacle offers nearly complete esports coverage in terms of the games. If you can bet on it they cover it. Find League of Legends, Counter-Strike (CS:GO), Dota 2, StarCraft (SC 2 and more), Artifact, FIFA, Rocket League, R6, Overwatch and more. Pinnacle has two distinct platforms for betting. Their mobile site is much like any other extremely well-designed and intuitive site. It really allows you to take advantage of their high paying odds with regular updates to accept higher odds as they change and the ability to really bet as you like. In addition to the normal way of betting, you can also ‘stake to win.’ So rather than stake a round number to win a strange number, you can stake the strange number to win the round number by simply entering how much you’d like to end up with on a won bet. Their desktop betting platform is a little different from most traditional betting sites, but it suits them perfectly as a low odds margin, high limit betting site. It is just as intuitive as other sites, if not more so, especially when it comes to creating combination wagers. With their desktop site, you get instant updates on odds changes with a countdown to the next update. For each potential bet, Pinnacle shows you the maximum amount you are allowed to bet, and this can get pretty high, as they are known for their high limits. Lastly, for combination bets (parlays), rather than having to navigate around the site between picks for all yours selections of interest, you simply select your leagues of interest for your combination bet and submit, the site then loads all the events and betting markets for your selected leagues. From that single page, you can create the your combo or parlay bet without having to navigate all around the site, page to page, adding picks to your bet slip. It looks a bit old-school, but it is highly-intuitive and actually a real time-saver. Very unique. Available banking methods always depend on your location. So for example, depending on your nation of residence, Pinnacle accepts credit and debit cards, paysafecard, Skrill, Neteller, EcoPayz, bank transfers, Bitcoin and various local bank debit solutions for many different currencies. Pinnacle offers a great ‘Payment Options’ feature through a link available in their masthead on every page. From this page you can find the available banking methods for each currency. Pinnacle offers many difference account currencies including: Euros, US Dollars, British Pounds, Brazilian Reais, Canadian Dollars, Chinese Yuan Renminbi, Colombian Pesos, Hong Kong Dollars, Japanese Yen, Korean Won, Malaysian Ringgit, New Zealand Dollars, Norwegian Kroner, Polish Zloty, Singaporean Dollars, Swedish Kronor and Thai Baht. Simply select your currency of choice when you register your account. Pinnacle is not a betting site that looks to offer new customer bonuses or promotions. They offer very high esports odds. In order to do this, they eschew the cost of offering free bet offers or other promotions. Their ‘loyalty program’ is the high odds that they consistently offer to their esports bettors. The bottom line: should you sign up with Pinnacle for esports? Pinnacle is an incredible choice for betting on esports. You get solid event and league coverage with a variety of betting markets and perhaps the lowest odds margins, meaning you get higher esports odds on average over time. If you will be serious into esports betting, playing regularly, they are a great choice. If you just want to bet every once in a while and would prefer a site that has more esports promotions, Pinnacle does not offer promotions at all. For a site that is heavy on esports promotions, you might want to look at Betway.